Let’s face it, Halloween and autumn have a stranglehold on the horror genre. It seems every time autumn rolls around and the air begins to get chilly, we are overwhelmed with lists of books and movies that are meant to get us in the spirit. While Halloween may be the undisputed king of all things horror, Christmas has its own legend that rivals the terror of any of Halloweens traditional icons. That legend is Krampus, a cloven-footed beast that serves as the dark foil for Santa Claus. While Santa Claus gets all the publicity since he is responsible for spreading joy and bringing presents to children (how can you not like Santa Claus), Krampus is just as important a figure whose own past stretches back to pre-Christian traditions. He is the one responsible for those who find themselves on the “naughty” list and is tasked with punishing them until they repent. While many children may scoff at the idea of receiving coal in their stocking, I have a feeling none of them would laugh at the idea of an enormous beast armed with sharp talons, a heavy chain and various other weapons dragging them from their homes. Matt Manochio uses this folklore as the basis for his debut novel, The Dark Servant, and goes right for the jugular with his opening chapter. It is Decemeber 5th, which is also known as “Krampusnacht”, and 18-year-old Travis Reardon is on his way to school. He seemingly has it all – football scholarships from numerous Division I schools, a beautiful girlfriend and a brand new car. His idyllic life is smashed when he discovers that the source of the foul odor he smelled all morning and the growls coming from the forest belong to a hulking beast that seems ripped right from his nightmares. It smashes his car with a giant chain before using its talons to rip Travis from his vehicle and effortlessly toss him into the large wooden crate strapped to its back. 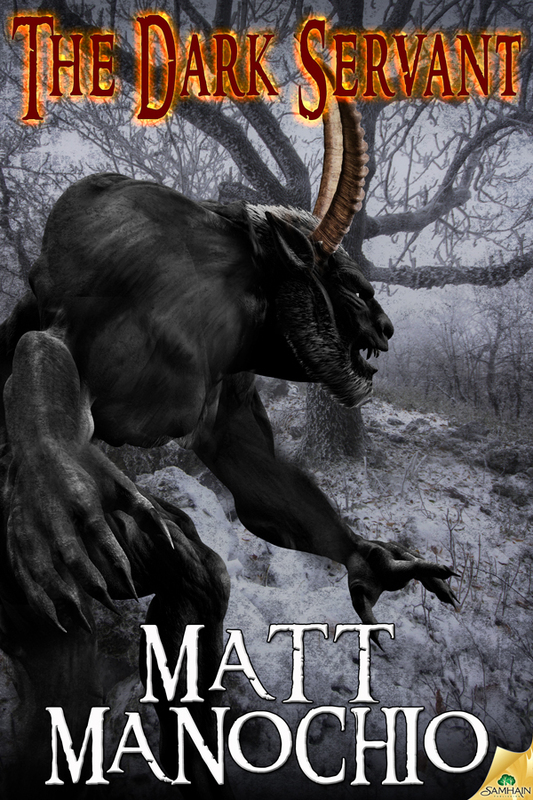 Travis Reardon becomes Krampus’ first unlikely victim and certainly won’t be his last. The novel then focuses on 17-year-old Billy Schweitzer, a seemingly average teenager who lives in Hancock Township, New Jersey. After discovering his fellow classmates and older brother Tim have gone missing under mysterious circumstances, Billy makes a startling discovery about the truth behind their disappearances while working on a project for his German class. Armed with little more than the folklore behind the Krampus and their wits, Billy, his longtime crush Maria and his best friend Mike decide to investigate the disappearances and soon find themselves face to face with an unstoppable evil. The Dark Servant is a highly entertaining debut effort and has many strengths beyond the originality of basing the story around Krampus. Manochio does an excellent job of utilizing pacing in this novel. Krampus literally bursts onto the scene in the opening chapter and is a constant presence throughout the novel, eliminating any potential lulls in the action. The characters are also well-developed in the novel. Billy is a character that anyone can relate to, whether they are currently a teenager or just someone who remembers those years well. He struggles with the divorce of his parents, living up to the reputation of his older brother Tim and dealing with the embarrassment of being turned down by his longtime crush. Manochio also does an excellent job of bringing Krampus to life and putting his own spin on the mythology behind the creature. Manochio sticks fairly close to the traditional hallmarks of the Krampus legend – his appearance, the rutens left on the porches of his victims and the chain among other things – but elevates him beyond being simply a frightening adversary by giving him a distinctive personality complete with a warped sense of morality and a dark sense of humor. Matt Manochio’s The Dark Servant is an absolute blast to read and horror fans looking to get into the holiday spirit will absolutely want to pick this one up! I can’t wait to see what other stories Manochio has planned for the future as he is definitely a talented new author to keep an eye on. Thanks for posting such a thoughtful review. So happy you liked it! What a fun read for the season!